An old man has been found out to have not had a haircut in over 54 years, a development which has left his hair overgrown. The man, who keeps his dreadlocks wrapped around his head as a turban, claims he hasn’t had a haircut in over 54 years. 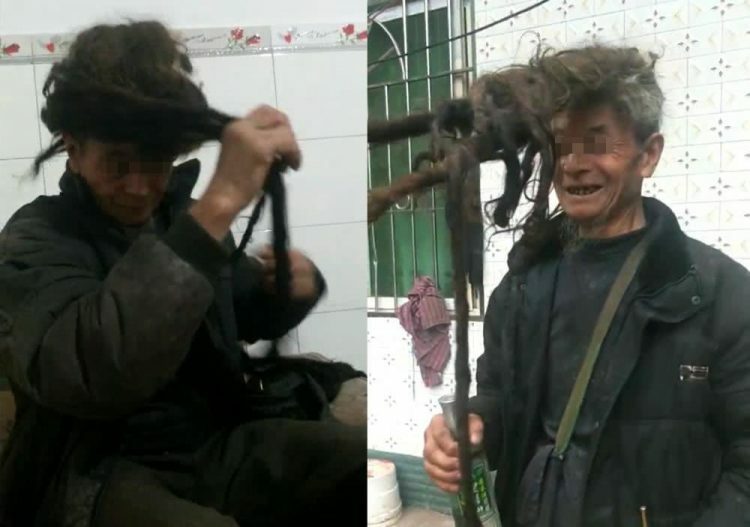 The 77-year-old’s unusually long hair went viral on Chinese social media after his daughter-in-law accompanied him on one of his long and frequent visits to a hair salon in Leshan, Southwest China’s Sichuan Province, to have his hair washed. She recorded a video of the staff there untangling his long dreadlocks, washing them in a sink and then painstakingly drying them, a process that reportedly takes two or three people around three hours to complete. The man’s daughter posted the footage online, where it quickly went viral, with over 1.5 million view in just a couple of days. People are now urging the man to apply for a Guinness Record, but his reasons for growing his hair so long have nothing to do with fame or recognition. When he was only 23-years-old, Ake Yizheng somehow got it in his head that letting his hair grow would keep him and his family healthy, so he hasn’t cut it since. The man’s daughter-in-law recently told the paper that in the late 1970s someone offered to pay 3,800 yuan ($570) for his hair, but he refused, as his family’s health was more important than money. Although managing all that hair can be inconvenient, especially when leaving the house, Ake says he has gotten used to it and refuses to get a haircut. The viral video, which shows Ake’s grandchildren untangling his dreadlocks and extending them to their full length of over 5.5 meters has gotten mixed reactions online. While some found the man’s ambition to keep growing his hair inspiring, other found his dreadlocks disgusting and urged him to get a haircut.